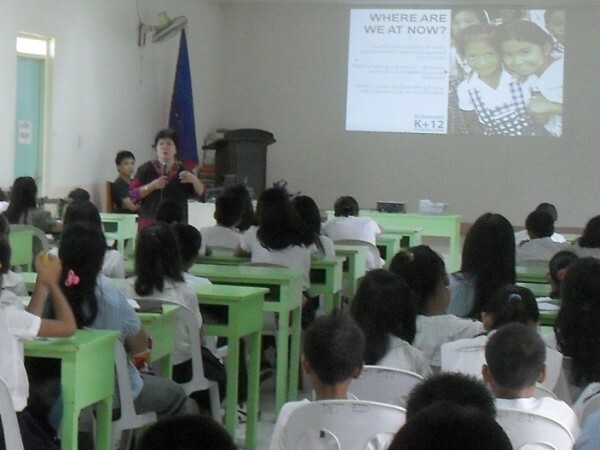 The pupil and student government officers of 23 schools both in Elementary and Secondary in La Carlota City attended the last 3 of the series of orientation advocacy on enhanced K+12 basic education program of the Department of Education (DepED) conducted by La Carlota division this morning. These would-be leaders of the country with their respective advisers manifested their support to this program as schools division superintendent Juliet A. Jeruta presented and expounded to them the rationale of K+12. President Noynoy Aquino III's statement cited by Jeruta through a media presentation said that there's a need to adopt this kind of basic education program “to add two years” to the country’s basic education to give the students the opportunity to be successful in their line of endeavor. Jeruta further stressed that based on the survey conducted the Philippines is the only remaining country in Asia with a 10-year pre-university program. It is necessary to modify the present curriculum for various reasons. And among them are to decongest and enhance the basic education curriculum, deduction of two years instead of adding 2 in the secondary and to provide better quality education for all. The pupils loved to be in school for they wanted to be happy and be successful in their life. Among the reasons why they are happy while in school are the highest grade they got in the test, the good, competent and loving teachers they have, and the friendship they have with their classmates and schoolmates. They also cited some situations why they are unhappy in their schooling. Some these are naughtiness of their classmates, the strictness of their teachers, the insufficiency of instructional materials, among others. Enhanced K+12 basic education program is otherwise known as K-6-4-2 model. It is interpreted as one year in kindergarten school, 6 years in elementary, 4 years in junior high school and 2 years in senior high school. In junior high school, linear formed competencies are introduced to equip students for higher learning. And in senior high school, the students are trained to be specialized in vocational competencies, in technical competencies, in science, music and arts, and are introduced to two foreign languages. This model K+6+4+2 equals to 12 intends, making the graduates globally competitive, better prepared for college work, no mismatch between industry need and school’s opportunities; they can cope in the field of work. At the conclusion of this advocacy orientation, the pupils, students, and even their advisers are challenged to do their part by the superintendent and they signify to their best in supporting this program by giving priority to their studies, by being obedient to their parents and teachers and they believe that enhanced K+12 would satisfy their ambitions in life. They wanted to be successful and be happy. Are you not teaching anymore? If you want to you could go back to teach again in elementary. Just reapply. Anything if I could be of help to you just keep in touch. By the way, thank you for following up this and be one of its followers.